There are, of course, so many ways to approach your dental care, so many ways to organize your thoughts in terms of your smile health, and that’s just how it goes! What works for one may not work for another. While prevention is pretty cut and dry (you need dental hygiene and visits with us), what about the other stuff, you wonder? 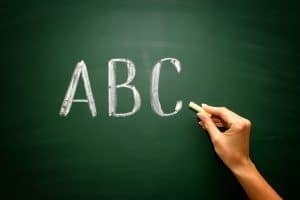 As mentioned, there are lots of options but today, our Livonia, MI team offers you one way to think about things: In terms of the alphabet and simple mnemonics. Let’s give ABC a try! When you’re not sure what’s happening with your mouth, you think something is wrong, you feel almost certain everything is just fine, and so on and so forth, there’s one very easy way to ensure you remain on track with your smile health no matter what: You schedule a dental checkup. Either you think everything is okay but you schedule your checkup and cleaning with us every six months anyway. Or, you think something isn’t quite right, so you either determine that you can wait until your upcoming dental care appointment or you call us earlier to add another visit in-between your preventive ones just so we can take a look to find out if everything is okay or if you require restorative care. Always do this and you’ll always be just fine. Brush and floss. Go about your day. If a clean smile resolves the problem, you’re fine! Brush and floss. Go about your day. If your clean smile still smells quite offensive, call us to set up a preventive care visit, so we can fix anything that’s off. You’ve gotten the breath, prevention, and restorative care stuff figured out. So, what about the way your smile looks, you wonder? Well, C if for cosmetic questions! If you aren’t sure about how to make your smile lovelier but you’re interested, just ask about cosmetic dental care. We’ll fill you in on the details! You know that you need to visit us as part of your comprehensive approach to smile care, of course! So, keep that going by seeing us twice a year for prevention (and more as needed) for consistently healthy tissues! James Stewart, DDS, and our team serve patients from Livonia, MI and the surrounding communities. To schedule a consultation, call our office today at (734) 425-4400.